We have an amazing team of dentists in Cancun and a customer care staff that goes beyond you can imagine to make you feel comfortable during your visit at our dental clinic in Cancun. One of the things that makes us different from any other dental practice in Cancun and in USA is the way our team treats all the patients that come to us. We are kind and warm with every single patient, looking to provide the most relaxed experience during their treatment. Hi! We are here with Kendall Johnson, our patient from Canada and he got here done a makeover, he has crowns and he got implants done. So can you tell us a little bit about your experience? It’s so good to have you here again. Ah thank you, thank you. When I started with kind of a mess here, now I’m waking to the mirror looking at it I’m so happy. I can eat, thing I couldn’t eat before. I love my veggies. I ran to the mall yesterday and I bought my broccoli. You know, I stayed at the local hotels, I eat at the local restaurants. I love Mexico. I’ve been many times and I’ll be many more. I couldn’t be more pleased with the work. I’m just very happy. What do you think about safety? Because we hear things sometimes, right? That is not safe to come here and you should like have to watch out for things. What do you think? How’s your experience been? I’ve been here by myself. My wife has come with me. We have walked around even at night. People are always smiling at us. I don’t see many other Canadians around. “Poquito Spanish”, but people are always helping me, you know, they speak a little bit of English, we laugh and we can communicate. I just have no problems. What do you think about the clinic? Have you had any good experiences with all the installation and everything that work here? Did you like it? Are you happy with them? I know sometimes I’m sure people are a little cold just so I’m not sweating, you know, being Canadian. They just take care of me. What do you think about the staff. Everyone that works here? I’ve been treated so well, I know I had some really though days. People were really sympathetic. I couldn’t say enough good things, that I feel welcomed, I feel taken care of, if there’s something I don’t understand, I’ll say and they’ll talk to me and explain it to me. It just been all good. So what do you think about the prices? It was if, maybe the same price you were gonna get in Canada? Or you’d say a little better? A little higher? What do you think? Well, thank you so much for watching! I’m sure we will seeing you soon again. If you could see a before and after, you would know what I’m talking about. Dental Bridge vs Dental Implants? What’s best for you? 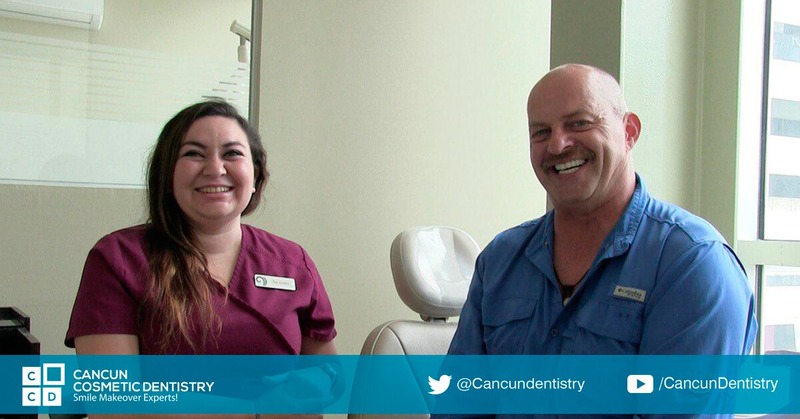 Cancun Cosmetic Dentistry has warranty on their dental pieces!